Our own Fed is withdrawing stimulus at the same time that our Government is looking to borrow record amounts of money. 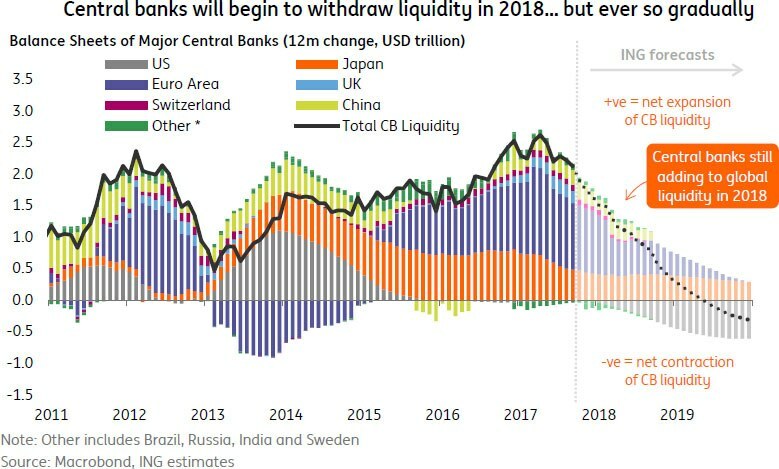 Just this morning they will be selling $17Bn worth of 2-year notes and $35Bn worth of 5-year notes and Thursday they will sell $31Bn worth of 7-year notes and that's AFTER selling $35Bn worth of 3-year notes on the 6th along with $23Bn worth of 10-year notes and $15Bn worth of 30-year bonds. That's $156Bn just to Fund Trump's September deficit! 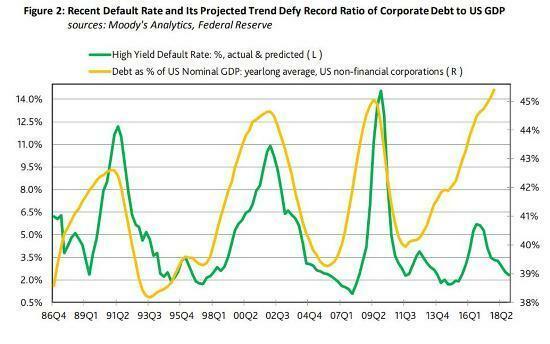 Corporate debt is also out of control as US non-Financial Corporations now owe a record $10Tn and they've been using that debt to buy back their own stock at a staggering rate. 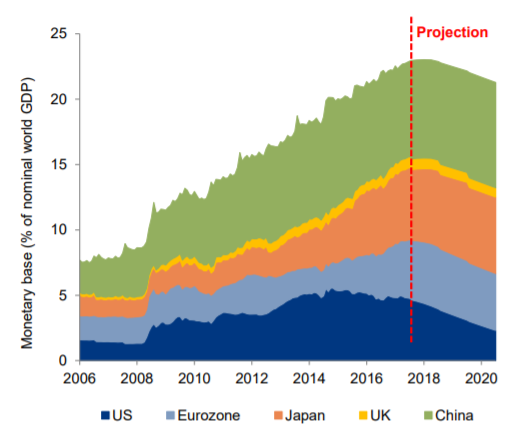 Last quarter alone, US companies bought back $189Bn worth of their own stock and the pace has been accelerating as the pressure to keep up profit appearances intensifies. That's not even including a rapid rise in M&A activity, which is like a buyback as you are deleting the stock of the company you are aquiring – giving your company more earnings per remaining share. It's a fantastic way to paper over years of inept management and anemic growth! On any given day, LUV trades about 4.5M shares at $62, which is $279M but those trades are bought and sold at similar prices and the net flow of cash in or out of the stock is more like 10% of that number, call it $30M/day. 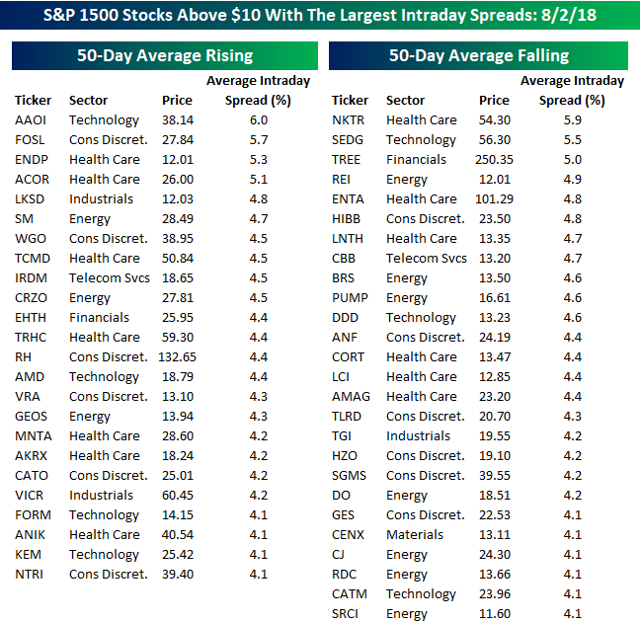 Over 200 trading days that's $6Bn and the company pushed $1.7Bn of that in – that's 25% of all net trading or 33% of "real" trading – all added to the long side yet, for all that work – the stock is still at $62, after opening the year at $66. These are distortions to a true picture of the market and lower taxes are a distortion as well as LUV paid $1.3Bn on $3.5Bn in earnings in 2016 but, for 2017, they got a $237M refund on $3.25Bn in earnings – do you count that tax benefit in for the long haul – or only until the next election? After all, these massive deficits don't grow themselves, you need to reduce revenues and increase spending at the same time. This entry was posted on Tuesday, September 25th, 2018 at 8:01 am and is filed under Appears on main page, Immediately available to public, Uncategorized. You can leave a response, or trackback from your own site. Still attracting tourists in the USA – maybe not for too long though! 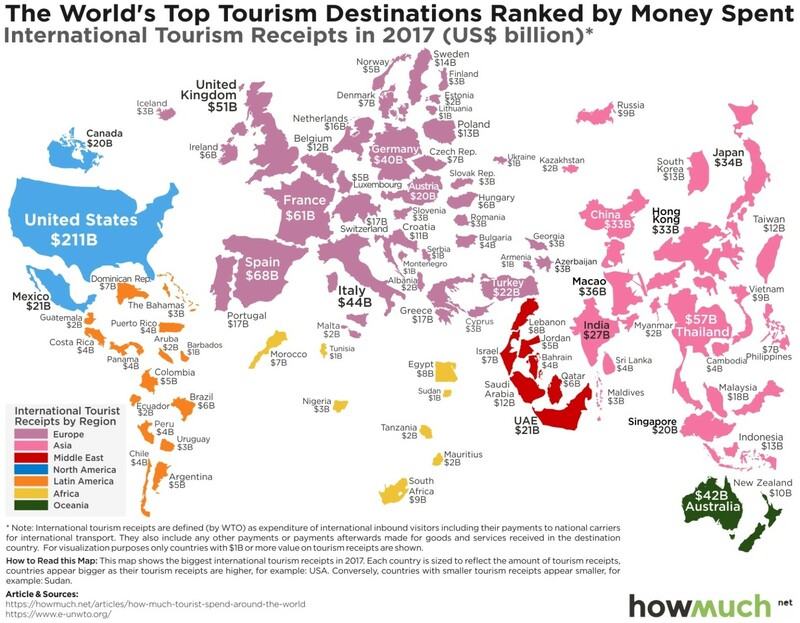 Interesting to see Spain now as the top destination in Europe. Maybe saturation for Uber and Lyft! Or people driving fewer hours because they found a job. Many possible factors. Qualcomm hopes the court will amend its allegations to an existing lawsuit against Apple for breaching the so called master software agreement that Apple signed when it became a customer of Qualcomm's earlier this decade. Monday's filing can be seen as the latest salvo in that dispute, designed to put pressure on Apple to settle. Qualcomm is alleging the stealing of source code and tools for the express purpose of helping Intel overcome engineering flaws in its chips that led to their poor performance in iPhones. CTL / Albo – Bummer indeed, but hopefully he setup the ship to go on without him. And maybe a buying opportunity sooner than expected. Piper Jaffray analyst, Harsh Kumar, reiterated his Overweight rating on shares of Broadcom Limited (NASDAQ: AVGO) after taking a deep-dive into Broadcom’s compared to other well-run semiconductor companies. The conclusion is that it stands out as cheap across many metrics and even trades at a deeper discount when the potential impact of the CA acquisition is included in estimates. with CA represents 25% upside". No change to the price target of $293. Took quick gains on /ES shorts as we had a quick dip. Oil heading the wrong way so we'll have to let it run and see if we get a good entry later. /KC getting cheap again, that's promising. Big Chart – Need to see the Nas catch up on the breakouts – it's lagging with the RUT for a change (or maybe leading lower?). They are both in danger of failing their 50 dmas so let's pay attention to that. Tourism/StJ – Turkey surprisingly good and everyone loves Thailand. If you think the Bahamas are crowded – imagine what's going on in Thailand (it's about the size of ! Gigs/StJ – That's because there's no limit on drivers so they saturate the market and reduce the "bidding" for drivers. Very efficient capitalism, really. Same with AirBnB as supply goes up or all these gig people as there is often more jobs than need. The thing is, if you want to open a restaurant, you have to be able to pay your rent and pay for food and, if it's not good enough – you go out of business, so there's not a surplus of restaurants or other "normal" businesses but if you want to be an Uber driver, you click a button and start driving (well, I suppose there's some vetting and insurance) so no barrier to entry is bound to lead to too many drivers and they all seem to have 4-star ratings, no matter how awful they are. In fact, if you don't rate your driver 5 stars, Uber app demands to know what's wrong with him so most people just click the 5 star button to avoid the hassle (not to mention the driver rates you back so people are afraid to say negative things – so stupid). QCOM/Albo, StJ – They can allege whatever they want but they'll have to prove it. Pretty much guaranteeing they'll never be used in another Apple device ever… And you know I always liked BRCM/AVGO better. Back below $72.50 on /CL – game on again. The CEO seems to think that they will be fine without Patel. The temp.(?) replacement, Need Dev has 14 years with Patel, and worked on the acquisition of Level 3. I think it's a loss they can manage. 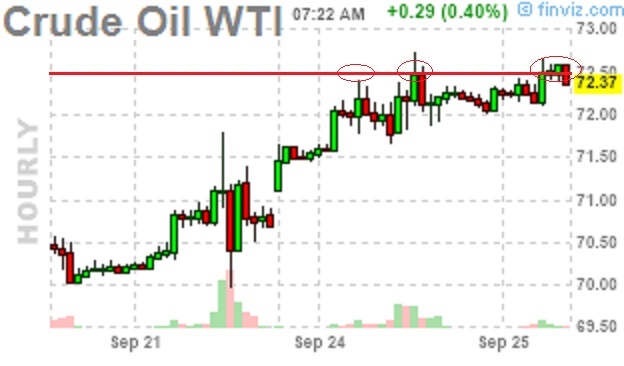 Phil – The OOP naked longs on ABX, or any position we may uncover. Do you wait until the LONGS are back in positive territory before covering? Stock is taking a hit . Now yielding more than 10%. There you go Albo… It is a much better entry price for CTL! My boat is full ! ABX/Grass – No, I wait until I think we hit a point where I think it's worthwhile to sell. Though it's happening quickly now, I was sure we'd get back to $12 and hopefully we'll see $13 before we cover but, if we falter here and look weak – I won't look a gift horse in the mouth. We have the 2020 $10 calls at $3.22 (now $2.50) and we could flip to the 2021 $8 calls at $4.40 and cover with the $15s at $1.45 for net 0.45 so that's the kind of move I'd like to make but, if ABX ends up not holding $11, then we do the same thing covering with the $12s, which are now $2.25 so we'd have the same roll with $2 less upside but a much loser strike to get even. Since the fallback plan is still attractive – there's no rush to execute a cover. 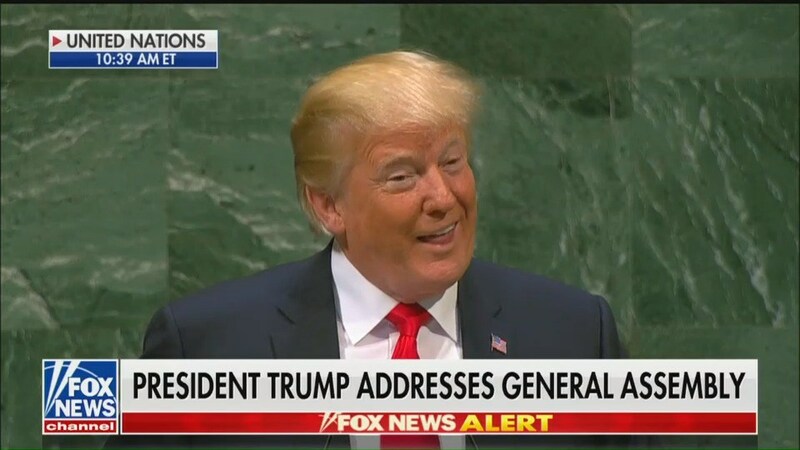 LOL – Trump just said to UN "OPEC is ripping us off" – Good for a quick 0.25 dip and I took it and ran! 'SBUX seems to be loving that cheap coffee! That dip was a serious buying opportunity. Should have added some more then. GE – The pain continues. New yearly low. Sugar – Similar to my thoughts on cheap coffee, where I thought SBUX would benefit, what about this commodity? What companies have a large exposure to sugar? The price has been in a steady downtrend losing over 60% over the last two years. (SGGFF- etf). Any potential stock plays on this low commodity price? GE/Albo – OMG! You would think at some point they have nothing left to give. Sugar/Tshroy – Warm, wet weather is good for harvests, they've been in good supply but near the bottom of the range. Don't know any good sticks but you can play /SBZ8 ($11.74) for what is often a Christmas rally. Contracts move at $112 per point. SONC got bought – that's one I used to bang the table on. Tourism / China sure loves Thailand and New Zealand is a popular place for them as well. tshroyer/Sugar - I am playing /SBH9, if Christmas doesn't boost, surely Valentines day would. I am scaling into another position now, I just played it for 90 days and it was a lot of fun. /KC is still a disaster from a while back, but working off the debt. And, will be glad to play it and /NG for the longer term months. /NQ back to 7,590 but getting close to the Fed. /CL tested $72, holding so far. The guy simply cannot help himself and go brag in front of the entire world that he has done more in 2 years than almost every administration! And they laugh at his face… There are probably 44 presidents that have done more than he did to make this country better! The insecurity must originate somewhere. Maybe Stormy can help us understand! Can't make this sh*t up…..
Trump/StJ, 1020 – Laughingstock is right – that's what he's turned us into. Nice little dip on the Dow but Nas still way up at 7,585 and /RTY still green on the day – so strange. MMM (-$2.50) and UNH (-$3) are hurting the Dow the most but nothing in particular stands out. MCD is up $3.74 and AAPL up $1.10. Dunkin' Brands (DNKN +1.1%) announces that Dunkin' Donuts plans to change its name to just Dunkin' in January. The company says the new branding conveys its broader focus on serving great coffee fast, while embracing Dunkin’s heritage by retaining the familiar pink and orange colors and iconic font. The new branding will be reflected on packaging, in advertising, online and on new and remodeled restaurants. Chain store sales increased 5.8% in the latest weekly read by Johnson Redbook. Chain store sales are expected to be up 5.7% for the full month. Clothing demand was reported to be strong last week. A federal appeals court sides with Uber (UBER), reversing a lower court denial of Uber’s motions to compel arbitration in three lawsuits from drivers arguing for employee status rather than independent contractors. The decision also reverses the decision that drivers in one case could pursue a class action suit. The drivers are suing for employee status that would entitle them to reimbursements for expenses. In other Uber news, the company is overhauling its disaster response methods with a Global Security Center that can hand out decisions about surge price capping and service suspension to local teams dealing with hurricanes, other natural disasters, or terrorist attacks. Uber agreed in 2014 to cap surge pricing during disasters or local emergencies but the actual enforcement has been uneven. 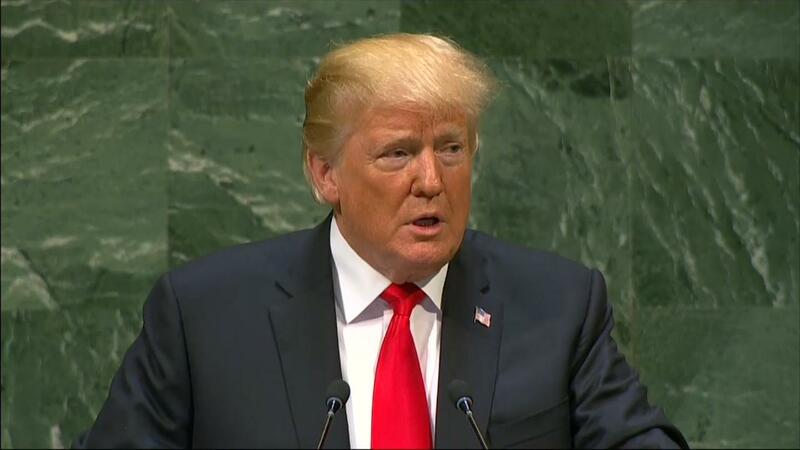 President Donald Trump, speaking to the United Nations General Assembly, says the U.S. will reimpose nuclear sanctions against Iran. "Sanctions will resume November 5th, with more to follow," he said. 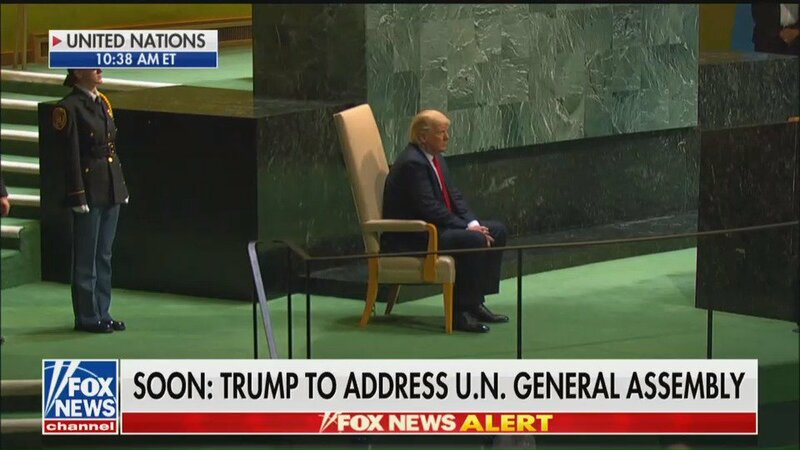 "I ask all nations to isolate Iran's regime." Earlier in the address he said,"In less than two years, my administration has accomplished more than almost any administration in the history of our country," which elicited some laughter from the audience. He also continued his nationalistic tone in saying "We must protect our sovereignty and independence." The S&P 500, which started the day up, fell slightly early in his speech, and is now essentially flat at 2,919.10; dollar index -0.2% at 94.05; 10-year Treasury note yield up 1.1 basis point to 3.099%. He also contends that OPEC nations are "ripping off the world," and demands that they lower prices. United States Oil ETF +0.13%. The big oil price rally may be short-lived, according to Janet Kong, who heads BP’s (BP+2.6%) Asia trading business, comments that stand in contrast to views from officials at oil trading firms Trafigura and Mercuria that see a looming supply crunch driving Brent crude to $100/bbl. Any spike on the loss of Iranian supply due to U.S. sanctions likely will not prove sustainable in the long run, Kong says, because the negative impact on demand from the U.S.-China trade war has not yet been priced into crude. “The market is very fixated on the loss of barrels on the supply side,” Kong says. "The market has overlooked the results of the U.S.-China trade war, how that might impact the global economy, China’s growth and the regional economy in Asia." A “meaningful tightening” of the market could occur in the next 3-6 months as Iranian oil exports shrink, but demand may be affected next year due to the trade war, Kong says, adding that within the next 12 months, supply probably will grow as OPEC raises production and the U.S. pumps more in 2019 after lifting production by 1.3M bbl/day this year. General Electric (GE -2.6%) shares slide deeper into the red after French power utility EDF (OTCPK:ECIFF, OTCPK:ECIFY) says it shut down a GE turbine at its Bouchain power plant for a month due to a turbine blade issue that has shut down similar plants in the U.S.
EDF says it took the action over the weekend after GE said last week it had halted four of its turbines at Exelon facilities in Texas when one of them suffered a blade failure. “The [Bouchain] plant will be closed until Oct. 22 to proceed with controls and maintenance as advised by GE," EDF says. Barrick Gold's (ABX +2.1%) merger with Randgold Resources (GOLD +3.4%) is sparking hopes for more deals in the heretofore unloved gold sector, lifting shares of rival miners including Gold Fields (GFI +1.8%), Sibanye Stillwater (SBGL +2%), AngloGold Ashanti (AU +0.6%), IAMGOLD (IAG +1.5%) and KIrkland Lake Gold (KL+4.8%). The deal could “could spur a pick-up in M&A, which in our view could result in a turnaround in mining equity performance,” RBC analysts say; mergers and acquisitions have become cheaper than expanding reserves of gold through exploration, says the Coast Capital hedge fund. The combined gold reserves still buried in mines shrank by nearly half to 11.3M oz. last year from its 2012 peak, according to Bloomberg, highlighting the urgency for mining companies to add projects to boost their production outlook and revive fading investor interest in the sector. Analysts say smaller miners also could benefit by buying non-core assets ABX wants to sell; the deal has even revived speculation that ABX could return to the negotiating table with Newmont Mining (NEM -0.1%) for a new tie-up after talks between the two collapsed in 2014. Jefferies says Amazon (AMZN +0.7%) could hit a $1.5T market cap within the next two years. Analyst Brent Thill thinks the growth potential of Amazon Web Services, Amazon Prime, and advertising could lift shares by 55% to $3,000 by 2020. Thill says AWS, advertising, and subscriptions are all growing 2x faster than the core with higher profits. The analyst conservatively estimates a combined $115B minimum run rate by 2021. Thill maintains a Buy rating on Amazon and lifts its target from $2,185 to $2,350, a 22% upside to yesterday’s close. Trading on Sonic (SONC +18.8%) has started up again after a delay following the company's buyout announcement during the premarket session. Sonic is swapping hands just slightly above the takeover price of $43.50 at the moment, but ranged as high as $44.87 earlier. Restaurant stocks are pretty active in early trading as investors gauge the sector following the private interest in Sonic. Restaurant runners: Jack In the Box (NASDAQ:JACK) +2.8%, Wingstop (NASDAQ:WING) +2.5%, Red Robin Gourmet Burgers (NASDAQ:RRGB) +1.7%, BJ's Restaurants (NASDAQ:BJRI) +1.7%, Wendy's (NYSE:WEN) +1.6%, Habit Restaurants (NASDAQ:HABT) +1.5%, J. Alexander's (NASDAQ:JAX) +1.3%, The ONE Group (NASDAQ:STKS) +1.3%, and Carrols Restaurants (NASDAQ:TAST) +1.1%. Wells Fargo is out with a quick note on the "surprise" Sonic (SONC +18.4%) sale to Inspire Brands. The read-through is significant for shareholders of Jack In the Box (JACK +1.7%). "While the company’s car-hop format and heavy drinks/desserts sales mix is relatively unique among restaurant chains, we do think today’s news will provide a near-term bid for shares of smaller, regional burger concepts like JACK, as investors use this recent data point to anchor a justifiable valuation range for similar business models (i.e., highly-franchised, smaller, low unit growth, regional burger chains)," writes the Wells analysts team. Corporate insiders are selling shares at an average of $400M per day this month through Sept. 21, the fastest pace in September in the past 10 years, while corporate stock buybacks reach record levels, according to TrimTabs Investment Research. This month's total volume of $5.7B in insider selling is already the highest for any September in the last decade. Meanwhile, stock buyback announcements by U.S. public companies reached $827.4B in 2018 to date, topping the previous record of $809.6B in 2007., TrimTabs said in a press release. Loup Ventures analyst Gene Munster estimates that Apple (AAPL +0.2%) Music has 21M North American listeners versus the 20M for Spotify (SPOT +2.4%). Munster says that adjusting for the addressable market, Apple is converting potential customers into paying customers at 2.5x the rate of Spotify. What’s driving the higher conversion? Muster suggests that the higher disposable income of iPhone owners plays a role, but Apple’s control of iOS and its built-in advertising to persuade subscribers. Munster says Apple Music still has growth room with 45M global subscribers out of the 780M active users. Spotify’s share of the global music streaming market has slid from 65% last year to 62% while Apple grew four points to 34%. More color on the Raymond James downgrade of Intel (NASDAQ:INTC) this morning from Market Perform to Underperform with no assigned price target. In July, Intel said its 10nm chips would release for holiday 2019. AMD’s (NASDAQ:AMD) 7nm server chips, manufactured by TSMC (NYSE:TSM), will have a volume launch sometime next year. Intel shares are down 1.8% to $46.09. AMD is up 1% to $32.94 and TSMC is down 0.9% to $44.50. Manchester United (MANU +2.5%) says it expects revenue in FY19 to grow to £615M to £630M. While the midpoint of the range would be record revenue for the soccer club, the midpoint mark also trails the consensus estimate of analysts for FY19 revenue of £625M. Manchester United also sees FY19 adjusted EBITDA of £175M to £190M. "Our increased revenue expectation for the year demonstrates our continued strong long-term financial performance which underpins everything we do and allows us to compete for top talent in an increasingly competitive transfer market," says Executive Vice Chairman Ed Woodward. Despite heavy investments in players, Man U is only in 7th place in the Premier League standings and trails cross-town rival Manchester City once again. Economic expectations for China experienced a considerable drop, according to the latest ZEW survey. The CEP Indicator, which reflects the expectations of international financial market experts regarding China’s macroeconomic development over the coming twelve months, fell to a reading of -16 for the period of September 6 to September 20, 12.3 points lower than in the previous month. The survey also indicated that China exports and private investment are set to develop more negatively over the next six months than previously predicted. ZEW on the yuan: "The surveyed experts expect the yuan to remain fairly stable in relation to the US dollar and the euro both over the course of the next three months and in a year’s time. Their assessment of China’s foreign exchange reserves (decrease of 30.8 points to a new reading of minus 12.0 points), however, shows that the stability of the currency is partially dependent on supportive measures from the government. It therefore remains to be seen when the latent devaluation pressure on the yuan will actually be reflected in exchange rates." As the Fed's policy-setting committee is set to meet Tuesday and Wednesday, the 10-year U.S. Treasury note yield rose to as high as 3.115%, vs. 3.078% late-Monday in New York, the highest rate for the note since it hit 3.151% on July 7, 2011, according to Dow Jones Market Data. The Federal Open Market Committee meeting, which starts later today, is expected to boost the benchmark rates another 25 basis points by the time the meeting wraps up tomorrow; the fed funds rate now stands at 1.75%-2.0%. Yields for the 10-year Treasury, which provide the basis for interest rates for all sorts of loans, have risen in six of the last eight trading sessions. S&P futures are up 0.25%, DJIA futures +0.3%, and Nasdaq futures +0.17%. U.S. dollar -0.28% against the euro. The dollar index -0.09%. This is why we're starting an MJ investment fund next year – look at what this small company was able to accomplish in just 2 years in Canada – the US market will look like this in 50 different states over time! The valuation of Aurora is silly at $9.3Bn but I don't mind shooting for a silly valuation and New Age will be close to $20M next year if we play things right – and that's just our first investment. Lloyd is in NJ this afternoon, putting together a group that expects to have one of the state's first 7 licenses. That alone can double our growth. So what percentage of New Age does PSW hold? DNKN – so what’s the guy going to do when he wakes up at 4am? Why does a long stock position have a maintenance requirement? We have 27.5% until we get our money back (through distributions) and then it drops to 16.5% after the clawback. As nice as it would be to have them fail to pay us back – we're still working diligently to grow the company and make our 16.5% as valuable as possible and, as I said, we're looking to set up a new fund for MJ investments next year as we see dozens of great places to invest in just NJ, NY, CA and Mass – which is where we've been concentrating so far. WTW/Rexx – Will they just be "Watchers"? I'm not a fan of throwing away 100-year successful brands – there's nothing wrong with owning a niche, why not just spin out a new brand rather than change the old one? 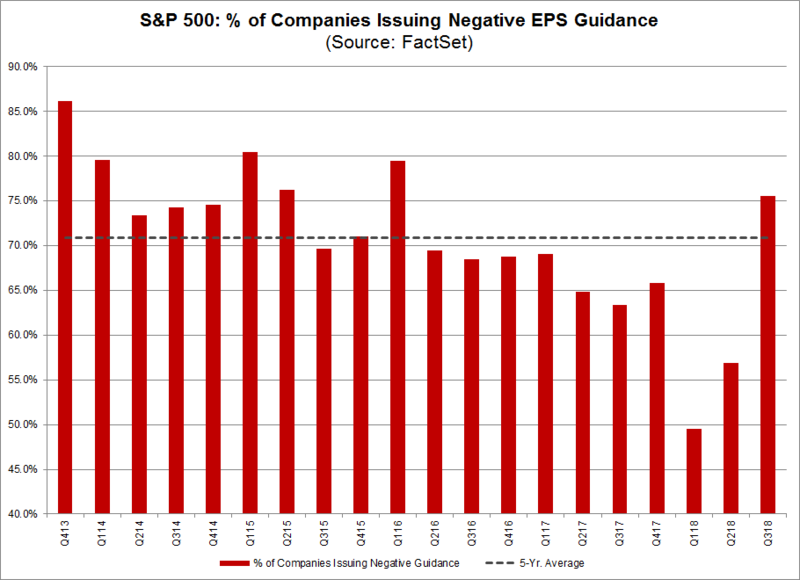 The trick is to find ones with good options that we din't think will do much on earnings. IRDM is interesting as I think they have simply moved into a proper value channel at $20 but, unfortunately, they are coming off a huge tax credit so I'm concerned real earnings will disappoint. Still, the Jan $22s can be sold for $2 and the 2021 $15 puts are $2.50 so maybe paired with a 2020 $20 ($5.50)/27 ($3) bull call spread at $2.50 it's a net $2 credit on the spread with a chance to sell more and more calls over time. Maintenance/Tangled – Well if you are buying on margin, it's up to the broker but I think 25% is normal. You can try to negotiate a lower rate but I'm not a fan of stretching margin too thin. Phil / LB – looks like it might be loosing momentum from the 'bottom'. I know you discussed this one and waiting, but I'm wondering if it makes sense to sell some short term putters now? Guess which way we went! LB/Batman – We have sold puts (long-term) but the short-term trend is still down so I don't think I would want to add risk – certainly not to our portfolio positions when the overall market is overdue for a correction. Now, if LB drops sharply, let's say $5 to $25, THEN the $35 puts should be $12.70 (the price of the $40s) and the $20 calls should be $6.70 (the price of the $25s) and THEN I'd want to roll the puts to 20 (2x) the 2021 $22.50 puts at $6 (now $4) and the calls to the 2021 $15 ($11)/27.50 ($4.70) bull call spread at $5.30 and DD on that as well. That would cost us net about $12,000 to move into a $50,000 spread that's almost all in the money at $25 plus the $12,000 we paid means net $24,000 so our break-even would be $21. Meanwhile, that's just the fallback plan and we'll see how earnings go. GLNCY- Glencore PLC- Metals/mining; Energy/coal/oil; Ag; etc. International in scope. No options, unfortunately but would like your opinion. Maintenance – 30% but bought with a small fraction of available cash is what is confusing. There is zero risk to the broker so why is there any maintenance required? But according to them it is a regulatory requirement to have some %. Maintenance – Found a more informative guy at Ameritrade. Now I get it. GLNCY/Pstas – Well they are huge, $62.5Bn at $9. The DOJ is investigating them in a multi-country corruption probe (which is silly as that's how business gets done in a lot of countries), hence the weakness and, of course, tariffs are a total wildcard. The reason the DOJ got involved (they usually look away) is because there was another suit involving Trump's sanctions and those the DOJ does jump all over – that's how this mess got started. As the stock dipped, the company just announced a $1Bn buyback – hence the bounce. Meanwhile, as a company, I'd say $8.50 is a reasonable price but, without options, not for me. I'd rather play FCX, who are similar but smaller and report in the US and have options. Of course the reason companies like this have p/e's of 10 is BECAUSE they can just as easily lose $2Bn (or $4Bn) as make it – it's a cyclical business and has up and down cycles. Since the stock is volatile, you get great option prices so you can buy FCX for $14.50 and sell the 2021 $12 calls for $4.50 and sell the 2021 $15 puts for $3.20 to net in for just $6.80 – called away at $12 with a $5.20 (76%) profit as long as we're above $15. Worst case is being assigned more at $15 to average $10.90 – still a nice discount to the current price and the dividend is 0.20 while you wait, which is 3% of $6.80, so not bad. An alternative would be the 2021 $8 ($7.10)/17 ($2.80) bull call spread at $4.30, selling the $15 puts for $3.20 for net $1.10 and, if you bought 25 of those for $2,750, you could sell 5 Jan $15s for $1.05 ($525) and that's 115 days out of 843 so 6 more sales like that would be $3,000 while you wait. Maintenance/Tangled – Yes, they must have some and I think 25% may be the minimum so some wriggle room I suppose. Former Bellator titleholder Phil Davis will face off with a fighter many have billed as a future contender. Davis meets Vadim Nemkov in the co-main event of a Nov. 15 Bellator event set to take place at the Menora Mivtachim Arena in Tel Aviv, Israel. MMA Fighting confirmed the bout with officials following an initial report by MMAjunkie. Phil / LB – I agree with you on the putters. I actually have had a brain fart just then…meant to say sell some short term callers. My reasoning is that they have come up pretty solidly in the last few weeks but the shares seem to be running out of steam. There is more risk to the dividend now from a FCF standpoint if things don't stabilize…. though they have never cut the divvy they have also not raised it since '16… Additionally their payout ratio is about 167% vs 70% in Jan. I don't see anything that looks really good in the next qtr or so…. Maybe the Nov or Jan $32.5 callers at .6 or 1.2??? The end of year is clearly their high season so maybe this is too aggressive for the payback? 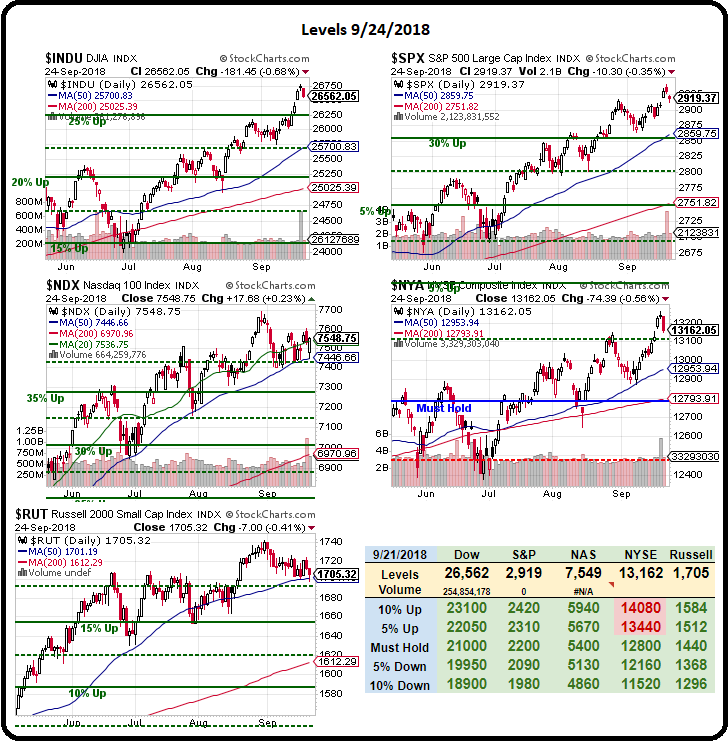 Indexes up a bit ahead of the Fed, Dollar back to 93.90 in anticipation of tightening and that's pushed oil down from $72.50 (again) back below $72 and /RB back to $2.05. /YG at $1,199 is tempting and /SI $14.485 at the moment. /KCN9 I will play long at $105 with a bit of conviction. China Says It’s Open to U.S. Talks, But Not With a Knife at Its Throat. Trade Deal Could Move Ahead Without Canada, U.S. Official Says. Trump tells world leaders: 'We will no longer tolerate abuse' on trade. U.S. Consumer Confidence Hits 18-Year High. Here’s how the Fed’s statement, dot plot and forecast may shift. Fed expected to raise interest rates and signal more hikes are coming. Salesforce(CRM) co-CEO Marc Benioff: The economy is 'ripping'. Grassley Schedules Kavanaugh Vote For Friday Morning. 'I'm confident we're going to win': Republicans are now bullish about confirming Brett Kavanaugh very soon. Iran Truck Drivers Go On Strike, Crippling Oil Infrastructure. WTI Drops After Surprise Crude, Gasoline Build. LB/Batman – I think it's too soon to cover. We should give them a chance to break out of the channel. 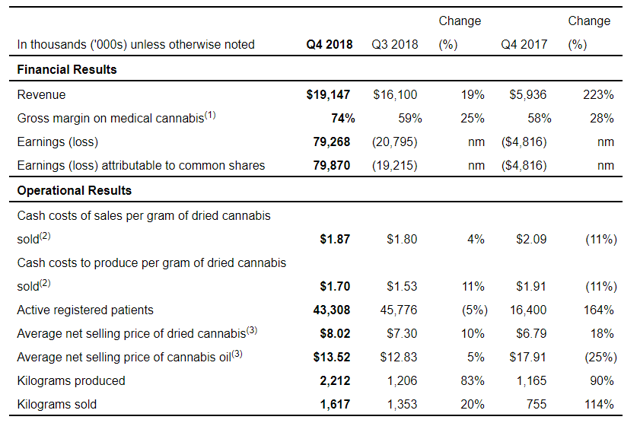 You're staring at a chart and letting it dictate your actions but LB made $100M last Q on $3Bn in sales and made $600M in Q4 on $4.8Bn in sales so figure 3x$100Mn + $600M is $900M and, at $29.66, the whole company is priced at $8.15Bn so p/e below 10 for a company that's only at the early stages of a turnaround is not one I want to cover so quickly but I tend to look at things as a long-term investor, rather than forcing a guess on the next quarterly report. They may take a loss on closing Henri Bendel in the next report so cover if that worries you but, as I said above, I hope they miss so I can roll down and DD, so I'm not looking to cover yet. Phil / LB – Thanks on LB – I do believe they have some house cleaning to do especially with the new CEO taking over at LB ( I think) and am looking to generate a bit of cash in the shorter term.